Select your heroes, gather allies, acquire artifacts, and work together with your friends to survive Middle-earth’s most dangerous fiends. By cooperating to overcome the obstacles drawn from the encounter deck, you will complete the quest before you and claim victory! In The Lord of the Rings: The Card Game, you and your friends take on the roles of heroes attempting to complete dangerous quests. Instead of directly retelling the classic stories that have previously been narrated, this game provides you with a variety of elements—characters, settings, enemies, events, items, artifacts, scenarios—that allow you to embark upon new adventures and share new experiences with these beloved characters during this ominous period of Middle-earth's history. Unlike most card games in which the players compete against each other, The Lord of the Rings: The Card Game is a cooperative game in which you and your friends work together, competing against a scenario that is run automatically by the game. In each game, you attempt to overcome the particular encounters, enemies, and challenges of the scenario, against which you either win or lose together. Accordingly, each player gains the freedom to choose which role he will play and how he will contribute to the group’s overall success. Throughout your trials, you and your friends can focus your decks around up to three heroes, each of which are affiliated with one of four distinct spheres of influence that offer specific advantages to the group. The four spheres of influence are Leadership, Lore, Spirit, and Tactics. Each of these four spheres of influence has its own distinct flavor and play style, and they can be mixed together within a single deck to present a host of deck-building options. Most player cards fall under one of these spheres, represented with a unique icon, as well as with a unique color on its card border, and each hero has an emphasis in one of these four spheres. A hero’s sphere dictates the types of cards that hero brings to a player’s disposal. The sphere of Leadership emphasizes the charismatic and inspirational influence of a hero, and that hero’s potential to lead, inspire, and command both allies and other heroes alike. The sphere of Lore emphasizes the potential of a hero’s mind. Intellect, wisdom, experience, and specialized knowledge are all under the domain of this sphere. The sphere of Spirit emphasizes the strength of a hero’s will. Determination, courage, loyalty, and heart are all aspects of this sphere, which also reaches into the more supernatural aspects of Middle-earth. The sphere of Tactics emphasizes a hero’s martial prowess, particularly as it relates to combat and overcoming other tactical challenges that might confront the party during a quest. 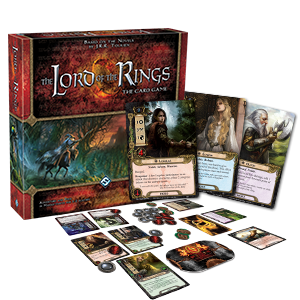 The Lord of the Rings: The Card Game Core Set includes 226 cards that can be used to assemble a wide variety of decks right out of the box. Included are three perilous quests that, along with countless combinations of settings and enemies, offer near-limitless replayability. While the Core Set contains everything you need to build your deck, gather your friends, and save Middle-earth, you can expand your experience further! As a Living Card Game®, The Lord of the Rings: The Card Game continually explores new lands and adventures within Middle-earth, and it offers an ever-expanding wealth of customization. Regular installments of 60-card expansions called Adventure Packs feature brand-new quests for the players to experience together. Additionally, these Adventure Packs bring new heroes, allies, attachments, events, and encounters to the table, ensuring a unique experience every time. Deluxe expansions also add new quests, heroes, and player cards, while simultaneously transporting the players to different areas of Middle-earth and introducing more of the unique encounters found therein. Saga expansions allow you to join some of Middle-earth’s greatest heroes for adventures pulled straight from the pages of The Hobbit and The Lord of the Rings. These introduce new scenarios filled with iconic enemies and locations, as well as new heroes and player cards. The world of Middle-earth awaits you. Gather your heroes and stand against the coming darkness! The copyrightable portions of The Lord of the Rings: The Card Game and its expansions are © 2011 - 2013 Fantasy Flight Publishing, Inc. The Lord of the Rings, and the characters, items, events and places therein are trademarks or registered trademarks of The Saul Zaentz Company d/b/a Middle-earth Enterprises and are used, under license, by Fantasy Flight Games. Living Card Game, LCG, LCG logo and Fantasy Flight Supply are trademarks and/or registered trademarks of Fantasy Flight Publishing, Inc. All Rights Reserved to their respective owners.